Now you can display and download to your GPS the tracks we made up for you in the Ribeira Sacra area. We work with a programme called Wikiloc where the following links will lead you. Wikiloc allows you to display the tracks in different ways (map, sattelite, relief), download tracks or make a virtual tour if you have installed Google Earth on your computer. Each track has associated numerous comments and fotos (for the time being the comments are in Spanish; we are working on the English version). If you preferr you can also download the tracks directly form this site clicking on "download gpx". Circular track River Sil Canyon: A Casa da Eira-Pé do Home. Download gpx View video. Circular track Santo Estevo-Viduedo-Pombar through the woods, villages and mountains of the Ribeira Sacra Download gpx View video. Walking in the surroundings of A Casa da Eira. You can start several tours directly from A Casa da Eira during which one can enjoy a spectacular view of the River Sil Canyon and discover the hills of Cerreda. 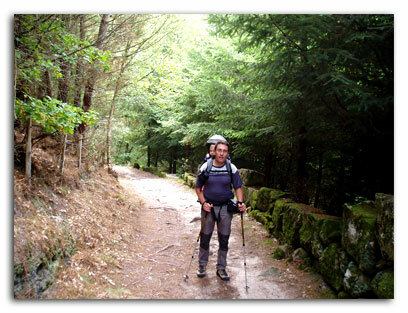 At Nogueira de Ramuín Ramuín there are a total of 5 itineraries with a distance from 6,6 to 11,5km and of medium difficulty. These paths allow the hiker to discover petroglyphics, megalithic burials, stone crosses, typical Galician granaries, Romanesque monasteries, churches, popular architecture, etc. always surrounded by a very special landscape. Another possibility is to undertake walking tours from the neighbouring townships such as the paths starting at the monastery of San Pedro de Rocas (Esgos) or at the monastery of Santa Cristina de Ribas de Sil (Parada do Sil). A special mention has to be made about the GR-56 the so called Trans- ourensán with a distance of almost 100km (Os Peares - Manzaneda). The village of Alberguería where the rural tourism house A Casa da Eira is situated, is crossed by this pathwhich covers part of the Ribeira Sacra, the San Mamedeand the Cabeza de Manzaneda Mountains (1778m). At A Casa da Eira we will be pleased to provide you detailed information for any of these routes in order to make sure that you will enjoy at its most your walking excursions.